Germany's SPD urged to drop opposition to joining "grand coalition"
There is new pressure on the German Social Democrats to reconsider their opposition to joining a new so-called “grand coalition” to resolve a political crisis never before seen in Germany’s modern history. 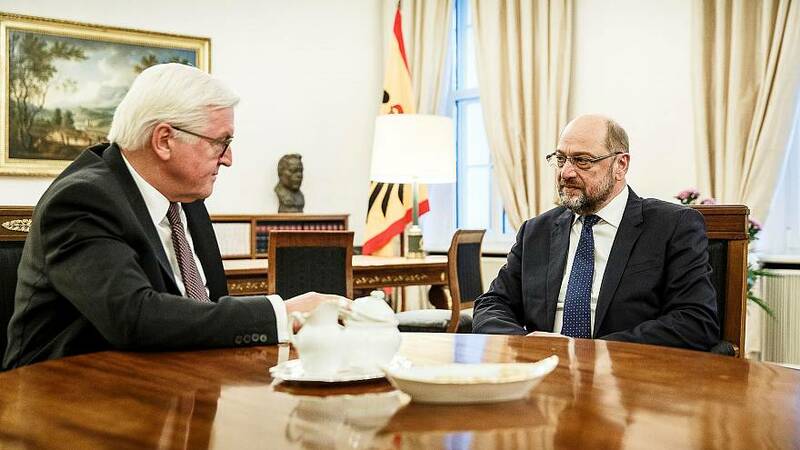 As the leader of the SPD, Martin Shulz, held a meeting with the country’s president, a key ally of Chancellor Angela Merkel urged the party to think again to ensure stable government after the collapse of coalition talks. The comments come from the leader of Merkel’s parliamentary group in the lower house of parliament, Volker Kauder. Attempts by Merkel and her CDU party to form a three-party coalition collapsed when the pro-business Free Democrats pulled out of four weeks of talks that also involved the Green party. The crisis has cast doubt on whether Merkel will be able to rule for a fourth term and comes at a bad time for the European Union. Germany is a key player in difficult talks over Brexit and in new efforts to carry out reforms in the bloc. The German president has called on all the parties to live up to their political “responsibilities”. He is holding meetings with all of the leaders.